Hannah and Maurice, David and Kate, Adeline and Elizabeth are fairly well recorded and don’t present any particular issues. So I have been focussing on the remaining children and this note relates to Matilda Rebecca. In the image above the green number “1” is a hint by MyHeritage suggesting a family tree that has her marrying a Charles Price. I have contacted the tree owner for further information but haven’t had a reply so far. My own researches suggest a completely different and much more intriguing story. The Census image doesn’t reveal where in Sussex Matilda claims to be born. There is no record of any marriage for a Reginald Hugall so Matilda’s maiden name is an open question. He dies in Q1 1893 in Islington. On 28 Feb 1894 she (“Widow of Reginald”) is admitted to the Camberwell Workhouse with her youngest daughter, Ellen, having been removed from St Mary, Islington. But both of them are discharged the same day on her “Own request on refusing to remain”. She is admitted again to Camberwell Workhouse on 17 June 1898 and dies there in childbirth 2 days later. Her unnamed male child also dies. The GRO index entry for her death gives her name as Matilda Rebecca Hugall. Since Reginald had died in 1893 he couldn’t have been the father of the child born in 1898. Perhaps the birth certificate will throw some light on this. Now, you would have thought that if she was born in Sussex Matilda’s Settlement would have been there. Equally, if she had actually been married to Reginald she would have gained his settlement – Holborn/Islington or even, possibly, Yorkshire where he was born. So why was she Removed from Islington to Camberwell? 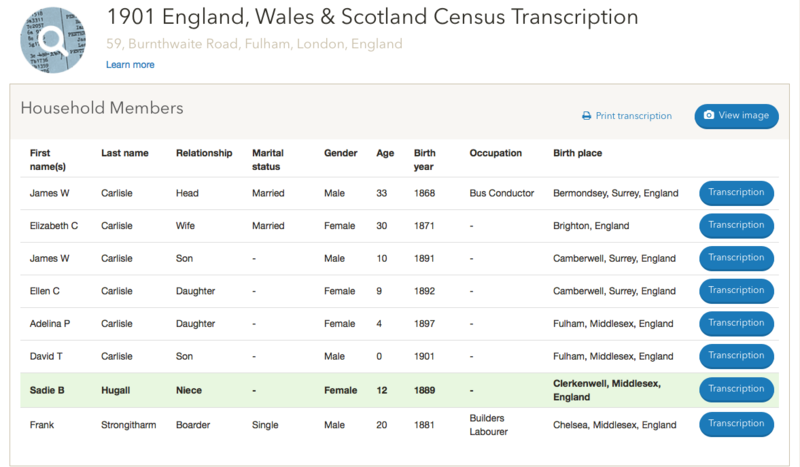 When the Jacobs family moved from Brighton back to London they are recorded as living at 37 Treherne Road, Brixton in the 1881 Census but then at 46 Shepardess Walk, Hoxton in the 1891 Census. Although not in the same Parish, Treherne Road is close to the Camberwell parish boundary and it is possible that the family lived at other addresses in South London and possibly also in Camberwell. Matilda Rebecca was still with her mother, living at 37 Treherne Road in 1881. The two sons – Reginald and Philip – were taken in by Bernardos and were eventually sent to Canada, both in 1894, although on different ships. Philip enlisted in the Canadian Army and died in France in 1918. Reginald, having married in Canada, moved to the USA in 1923 with his wife, Mary, and three boys – Harold, Teddy and Victor. He died in Macomb, Michigan in 1953. In 1901 Ellen, Matilda’s fourth child, is in Camberwell Workhouse and in 1911 working in Berwick Street, Soho. Note that she was named Ellen – the same name as Matilda Rebecca’s mother. There is no birth registration for her or the other children, except for the unnamed child born in 1898. So that seems to resolve what happened to Matilda Rebecca and a very sad tale it is. Obviously there is much more work to be done and eventually I would hope to link up with any surviving descendants. I will press ahead with researching this family and also with the other children and report any further discoveries. Any comments would be welcomed and please feel free to pass on to any other family members. We have no direct knowledge of Samuel’s early life. We can only assume it was typical of the life lead by many poor families in London at the time and according to history there was little pleasure to be had. He was one of five children. Of his siblings the only one we know anything about is his brother Lawrence. Samuel stole a handkerchief and was deported to Tasmania for seven years. This was at a time when a sentence of seven years meant the person very seldom returned to their home country. He was 18. His brother Lawrence later went to Melbourne, Australia and met up with Samuel. When Samuel stole a handkerchief in 1833 we wonder whether he had any idea where it would lead? His prison record is a catalogue of offences. His original sentence of 7 years was twice extended. First in 1837 when a further 3 years were added for stealing yet another handkerchief! And again in 1838 when he was given another 2 years for ‘larceny under £5’. He was fortunate the amount was under £5; larceny over £5 was a capital offence. During his twelve years much of his time appears to have been served in prison rather than being allowed out as many prisoners were. He makes 29 appearances before the officials resulting in an impressive 4 years of hard labour, a good part of which was served in chains. He also spent a total of 3 months in solitary confinement. Additionally he received a total of 111 lashes – and was lucky not to have received a further 50 on one occasion, avoided by apparently being able to ‘give very useful information’. Whilst his prison record sounds horrendous, should it have been? By today’s standards the crimes he committed, in total, would probably not result in a custodial sentence at all, or a short term one only. On two occasions he stole a handkerchief, once that resulted in his original sentence and once while serving his sentence. What of his other crimes whilst in prison? Absent from muster, being in possession of some flour, disobedience of orders, absent from barracks, insolence and refusing to work, making use of obscene language, having some dough in his possession, having a quantity of apples in his possession, having raisins improperly in his possession, assault. Not exactly the most heinous of crimes are they? If his behaviour in prison is typical of the man then it is likely that he was a criminal before he was caught in 1833 – can we find him in other courts? So far we have had no luck with this. Could he have simply been rebelling against what he thought was an injustice? Whatever the reason it is unlikely that he changed once he was set free. If the punishment he received didn’t stop him whilst in prison it is unlikely that he would change once he was free. His “free certificate” was granted in 1845 and there is no documentation about him until his marriage in Hobart, Tasmania, in January 1849. His bride was the daughter of another convict and it is supposed that this would be the social level he (and she) would be allowed. They had one child while living in Hobart. Samuel and the family moved on to Melbourne. Here he became a stable-keeper*. Another child was born while they were there. Samuel’s brother Lawrence joined them in Melbourne. Little is known of his life in Melbourne but it is obvious he and Lawrence made contacts they later used for transacting business between Melbourne and Hokitika, N.Z. They became “dealers” at Clyde, N.Z. * where gold had been discovered. Later Lawrence returned to Melbourne and Samuel and family went to Hokitika. At that time Hokitika was a thriving and busy port and was the nearest New Zealand port to Melbourne. It is obvious the brothers had many deals on the go – the record of goods they imported to Hokitika from Melbourne* was wide and varied. Here Samuel seemed to establish a “normal” life for himself and his family. He had a wife and family; he had a business; he attended and was a choir member* and office bearer of the Jewish synagogue*; he bought the rights to operate the tollgates at Omotumotu* – for which he paid £615 for one year; he chaired the Hospital Committee*. He also had the unfortunate habit of getting into petty trouble – unregistered dogs, straying horses, sly-grogging, an “innocent” role in a perjury case, bankruptcy. For these there were several fines but no prison, hard labour or lashes. He was a free man. Samuel’s wife, Fanny Matilda, died in 1869 and in 1876 he re-married and had three more children while living in Hokitika. In 1878 the family moved to Christchurch, N.Z. Hokitika was beginning to lose its importance and Christchurch was growing. Samuel and Emma had a further five children, two of whom died after surviving a few weeks. Once again Samuel was a dealer but there are no reports of nefarious activities in Christchurch. Reviewing this again in November 2015, I find that for some of the statements made I cannot find my original proofs. Therefore they must be considered suspect for now. Some doubts have been raised recently, November 2015, about this so this is an attempt to review the evidence. 1872 He is the defendant in a case brought by his late brother David’s sons. He put up a sign on his shop ‘Brother to the late David Jacobs’ but the ‘Brother to the late’ was so small as to not be noticed. When he was in Brighton entries in the various trade directories for Brighton indicate that he was originally there in a business and house belonging to David Jacobs – his elder brother. We don’t have either of his marriage certificates. It is believed that he married his first wife, Ellen Silverstone, in Ohio/Kentucky but no documentation of the marriage has been found – yet! In any case the Cincinnati records were destroyed in a fire around 1870 and although the records have been reconstructed Henry was back in England by then so probably wasn’t aware that the authorities were asking people to re-register. 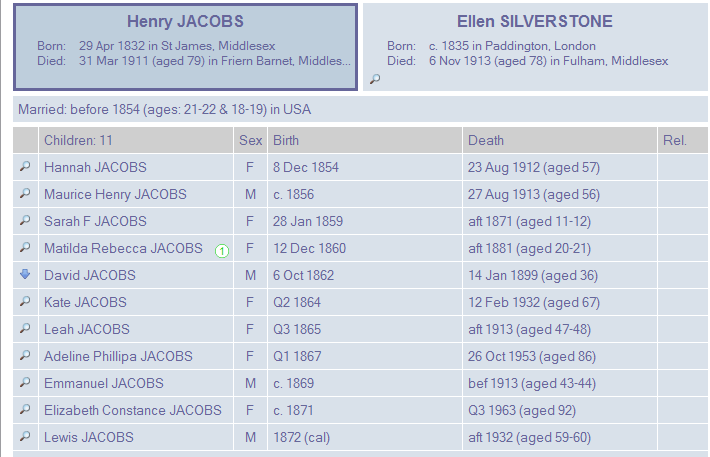 Ellen died in 1913 so they obviously separated sometime between 1871 and 1881. If they didn’t divorce then this would probably explain why we can’t find a marriage between Henry and Elizabeth Twine. His will index grants probate to his widow, Matilda. 1839 Moses Jacobs brings a case against an occasional employee of his. The business is owned by Moses, but it is his son, David’s, name that is above the door. David Jacobs testifies that he is the son of Moses Jacobs. He says that it is father’s name that is over the shop – Jacobs. We have a direct link between David Jacobs and Moses Jacobs. This was first mentioned in the ‘Jottings’ section by Phil Kirby back in 2008. The connection being that Harry Braham Jacobs married Clara Samuel. I haven’t had the opportunity/inclination to follow this up until it raised its head when Shlomo Katanka started sending me some information. When I started looking I found that there is quite a lot of information out there, unfortunately not all of it is accurate as it might be and I always try and do my own research to confirm it where possible. The most helpful were the notes on the MAN & Other Families website plus some basic information from the H Samuel corporate website. Therefore I decided to do my own research so that I could confirm, to my own satisfaction, that the link was correct. There is no intention to follow the Samuel tree any further at this time as there is no direct link back to David Jacobs/Litzen, it was merely to answer the question. For those who are not from the UK, H Samuel were, and still are, the major High Street jewellers here. Note: Many places on the Internet use the spelling of Wolfe whereas I have used Wolf. This is because in the GRO indexes for the marriages of Henry, Walter and Alfred, the name is shown as Wolf. 3. As I didn’t have a copy of either of Clara’s marriage certificates I searched elsewhere. I found an entry for their marriage in the Jewish Chronicle (thanks to Gerry Newnham for downloading the entries for me). This confirmed that Clara’s father was Henry Samuel and gave his address as Redcliffe Road, South Kensington. 4. Looking at the censuses for Clara, I found her in 1861 and 1871.
b. In 1861 she is with her parents and siblings. Parents are Henry and Rachael as expected. (Henry’s brother Walter is living a couple of houses away) Henry is listed as a watchmaker. 5. So now I needed to find a link back from Henry to his father. 7. In the 1851 census we find Walter is living with Henry and his wife. Both are watchmakers. 8. Therefore I believe that we can confirm that we have confirmation of the connection. The main focus of this article is to try and establish what happened to Harry Braham Jacobs. Harry Braham Jacobs was the son of David Jacobs and Matilda Rebecca Jacobs. He appears in the censuses for 1861 and 1871 but no later ones. He married Clara Samuel in 1881 in London. They had four children, they then appeared to vanish. Did Harry die thus making Clara a widow and free to marry Nathaniel Platnauer? Did Harry and Clara divorce? I assume the answer is yes, because Clara’s subsequent marriage was carried out by the Rabbi. Why, when she died, was probate granted to Henry Samuel, Merchant? When and where did Harry die? Debbie Bozkurt did some research in 2008 which indicted that Clara Samuel was a member of the well-known (in the UK) H Samuel, the jewellers, family. There is a snippet about this on the website – search for Platnauer. There is some evidence to indicate that at certain times Harry was referred to as Henry B Jacobs and Harry Braham Janson. During her research, Debbie had picked up that Clara remarried this time to Nathaniel Platnauer and they were living in South Africa. Between Debbie’s research and 2015 I had not followed up on this project. Then in August 2015 Shlomo contacted me as his wife descends through Harry Braham Jacobs. Shlomo was able to give me the tree descending from Harry & Clara down to his wife Channah Leah. Shlomo then provided what information he already had and we started work from there. Whilst Shlomo’s information was broader than Harry Jacobs, it is really only the Jacobs side of things that are covered in this article. Some of the extra information may well make it on to the site once this research is done. Shlomo has also provided a good number of photographs, most of which will appear in the Gallery in coming months. Those relating to individuals in the tree will also appear there. Starting with the usual Internet searches, this brought up a number of hits, many of them with some incorrect data. We then proceeded to use the usual sources for BMD etc. to confirm what had been indicated already. We know who the four children of Harry and Clara were, but cannot find births, marriages or deaths for two of them: Nora and David. Although we do know that Nora married George Mansell. From the photographs that Shlomo provided, it was possible to place the families in the UK or South Africa at certain time as the photographs were well annotated by Grace, daughter of Harry & Clara. Some passenger lists and voting lists also helped establish time lines. The focus for the timeline centres around the apparent end of Clara’s marriage to Harry and he subsequent marriage to Nathaniel. 1888 Harry, Clara, Grace, Nora & David are in a photograph taken in London. 1906 Platnauer family photograph in Lichtenberg, South Africa featuring: Byron, Nora, David, Grace, Clara, Nathaniel, Joyce, Natalie, Gloria. The move was before 1895 when Harry is in Bulawayo and Grace and Nora are in Grahamstown [As we can’t find them in the 1891 census we could possibly assume that they moved prior to that. Unfortunately, at the time of writing (8 Sept 2015) we have not been able to find any other information to clarify events. Byron Jacobs was the eldest child of Harry Braham Jacobs and Clara nee Samuel. He was born in the Hendon area of London towards the end of 1889. His father was a dealer of various sorts – unfortunately he doesn’t feature in any of the UK census after the age of 11. Byron had a brother, David and two sisters, Nora and Grace. Sometime before 1895 the family emigrated to South Africa and ended up in Bulawayo where Harry was a Stock Broker. It is assumed that his parents, Clara and Harry, were divorced, because Clara’s subsequent marriage to Nathaniel Platnauer in 1899 was conducted by a Rabbi. The marriage takes place in Bulawayo where the Jacobs were living. The Platnauers start a family of their own, having three daughters Joyce, Gloria and Natalie, all appear to have been born in Lichtenburg, South Africa. We that Harry continued to live in Bulawayo and operated as a Stock Broker. From photographs we know that Byron and his siblings kept in touch, at least, with their mother. Unfortunately we have no details of whether or not they were living with her and her new family. A Platnauer family photo of 1906 taken in Lichtenburg shows Clara with all her children, both Jacobs and Platnauer. 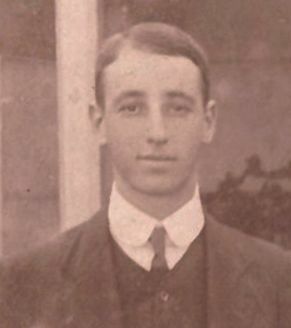 In February 1916 he travelled from Durban to London on the RMS Saxon, travelling 2nd class and gives his occupation as Electrician, aged 25 and from the Transvall. By mid 1916 Byron has ‘joined up’. When he actually enlisted is uncertain. 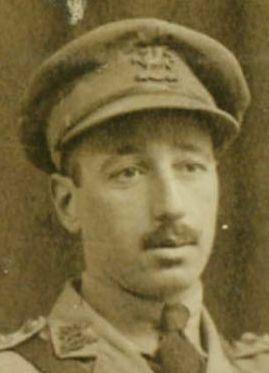 Originally he was a Lieutenant in the Defence Forces of South Africa but transferred to the East Kent Regiment (The Buffs) in March 1916 but also served with the Royal Flying Corps (RFC). This probably accounts for some of the confusion around the details. In November of 1916, whilst a Lieutenant in the East Kent Regiment – Special Reserves, he is awarded the Military Cross for conspicuous gallantry, having taken command when his senior officer was wounded. He took command of the company and continued the attack. Somewhere along the way he is also awarded a bar to the Military Cross. His military record refers to both the MC and the bar at the same time. 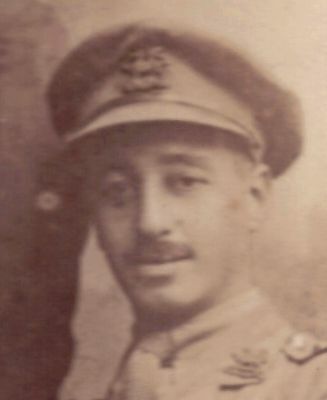 In 1917 he became one of the first Jewish members of the Royal Flying Corps (RFC) and was a scout pilot. In September 1918 he crashed the Sopwith Camel he was flying and was injured. He struck and air pocket close to the ground while diving on ground target and struck ground. According to his military record he spends the rest of the war in hospital as a result, being discharged from hospital in January 1919. He is dispersed independently in March 1919 and then transferred to the Unemployed List in April. As to his rank at the end of World War I, we have a bit of confusion. I only have part of his military record (many of WW1 records were destroyed). In one record he is referred to as Lieutenant but I suspect that this an out of date entry. However we know that he is mentioned as a witness at the inquest into the death of Lieutenant William Rhodes-Barnett in Eastbourne in 1918. In the publication he is listed as Captain Byron Jacobs. Additionally, he gets his Competitors Certificate from the Royal Aero Club in 1918 as Capt. in The Buffs. Sometime after his demobilisation he returns to South Africa. A photograph of the Platnauer family dated 1919 shows him in uniform. In September 1921 he returns to the UK from South Africa on the SS Balmoral Castle. His age is given as 29 but no occupation is listed, but we do get a destination address of 4 Parsifal Gardens, Hampstead. Everything goes a bit quiet now and we have no information. In 1932 Byron marries Evelyn Mary Sayer in London. Unfortunately we know very little about Evelyn that can be confirmed. 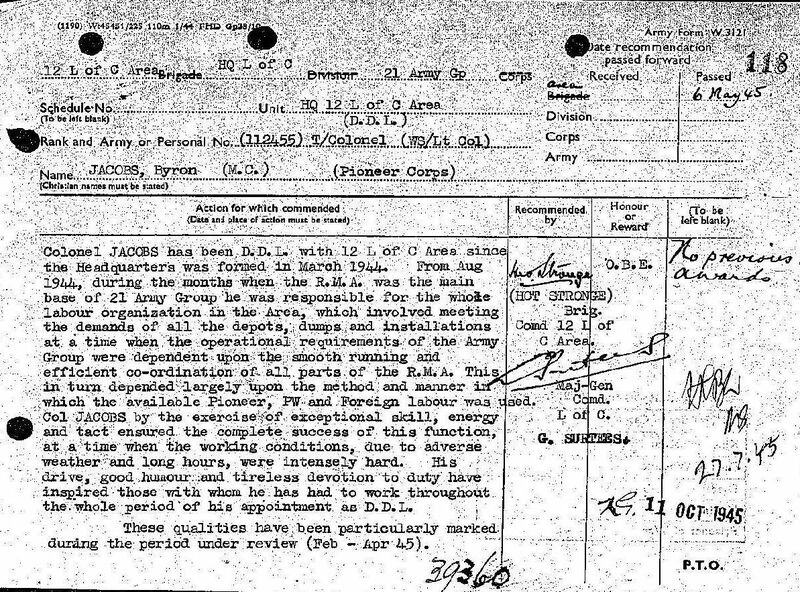 9th April 1940 he is gazetted as 2nd Lieutenant. He is listed as Captain Jacobs,late the Buffs. This smacks to me of the British military doing its own strange thing. He was a Captain but left The Buffs so they are bringing him back in at the bottom so that he can be promoted. Within the army there is a matter of seniority (based on start date in a given rank). So I suspect that this is simply a way of getting things in the right order? In 1945 Byron is made an OBE for Meritorious Service. In October 1947 Byron and Evelyn travel back from South Africa on the SS Capetown Castle. His age is given as 57 and hers as 45. Their address is c/o South Africa House and his occupation is ‘Director’. We have two photographs (1940 & 1961) showing him with a lady called ‘Jo’ but we don’t know who she is. There was a thought that ‘Jo’ might be his step-sister Joyce, but looking at contemporary photographs of both women seems to contradict that. Byron dies, in Brighton, at the age of 79. Colonel Byron Jacobs, who died last week at the age of 79, was for over 20 years the chairman of the Ex Service (1943) Association, the organisation of refugees from Nazi persecution – most of them Jews – who volunteered for service in H.M. Forces during the Second World War. In 1917 he became one of the first Jewish members of the Royal Flying Corps in which he was a scout pilot. His association with the then “alien” members of the British Forces started in December 1939 when he was posted from the Reserve to Richborough Camp, the training centre of the British Pioneers. He was promoted to major and commanded one of the ” alien ” Pioneer Companies. When the war ended he was a full colonel and deputy director of labour and he was appointed CBE in 1945. In the same year, immediately after demobilisation, he took over the chairmanship of the Ex-Service (1943) Association, and he had occupied that post – with the exception of a three years’ stay in South Africa ever since. Whilst we are well familiar with the name Jacobs, we are less knowledgeable about Litzen. This short article attempts to aggregate our knowledge of the name. One of our main sources for the name is research done by Hyamson. In this document the name Litzin is used several times, sometimes in English and sometimes in Hebrew. 1793: Great Synagogue Marriage records show Henry Jacobs son of David Letson, marrying Kitty Moses. 1799: Henry Jacobs (1767 – 1865) became a member of the Great Synagogue and his father is given as David Litzen. Phil Kirby did further research and came to the belief that the surname is LITZEN which is German and also a town name in what was Western Prussia. The town still exists. Philip believes that David Litzen moved around the Polish/German areas and came to the UK probably to escape the Polish podgroms. Philip has also looked at the Polish History and the Russian history and have a pretty good idea about the changing influences on Jews in those areas. If you look on Familysearch site ( the Mormons) you can see the family name Litzen and it is usually Swedish/German/Finnish. Philip thinks David Litzen changed his name to Jacobs for business reasons and also because it was easier to pronounce. Other contributions in the past have also come from Debbie Bozkurt and Carol Freeman. There are quite a lot of Jews named Litinsky , or similar. Because this is the way to write “t” in Belarusian. Some of my family spell it Litin, some spell it Lizin.